Exchanging thoughts with your peers and enjoying leisure together is so important for patients with chronic disease. 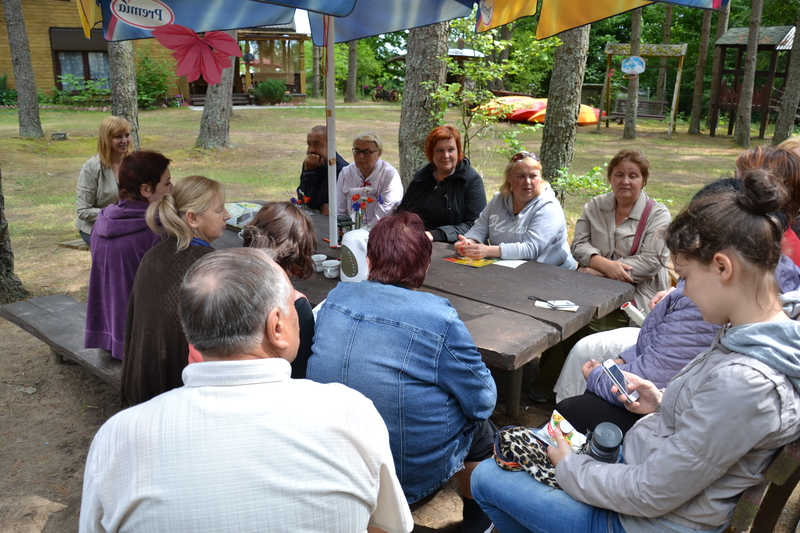 In Lithuania, the patient association Gyvastis organises a summer camp every year to bring together various patients, their relatives, doctors and other supporters. This year it was all about nutrition and active lifestyle. Lavysas is a lake in Southern Lithuania. Its water ripples against the backdrop of the Dainava woods, near the town of Varėna. Located on the west coast is the village of Lavyso. In this picturesque village, members of the Lithuanian patient association Gyvastis organised a three-day summer camp for chronically ill patients to relax and to learn how to live an active live despite their illness. The camp takes place every year in July. This year it hosted twenty people from throughout Lithuania, ten of whom were dialysis patients. In her lecture, Danutė Keinaitė also talked about the fact that being either overweight or underweight increases the risk of disease or, in the case of atherosclerosis, type II diabetes, anorexia and bulimia, it can exacerbate it. Excessive bodyweight or bodyweight that is too low leads to substances being processed differently in the human organism. In scientific literature, cases are described where a strict diet and regular exercise were the main factors in curing type II diabetes. She pointed out that a healthy diet should not be confused with the range of drastic “diets” which are predominant on various Internet portals. For renal patients it is especially important to follow the recommendations of their doctor. The rest of the camping days the participants enjoyed leisure to find inspiration and gather new strength. They organised walks through the surrounding countryside and woods, enjoying the pure pine forest air and the fresh water of the lake, picking mushrooms and berries. Howeve, the mushrooms and berries were scarce – apparently it was not the right time. A special highlight during these days was the sports competition. To the pleasure of the audience it was opened by the Greek mythological god Zeus together with the love goddess Aphrodite and Prometheus.